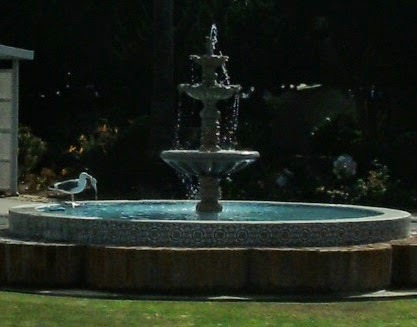 Josie and I started our morning walk like every morning, with him off his leash nosing around the fountain. The fountain is in the middle of a green, clipped lawn in the middle of the cul-de-sac we now live on. Every morning Josie likes to nose around the lawn, its curb, the brick wall of the fountain. Throughout the day this little island at the end of our asphalt lane is much-visited by other little dogs, on leashes, walkers in tow, and any number of seagulls. This little gull stopped by with his laundry. The dogs, of course, do business on the island, and Josie’s morning perusal of the area can well be likened to one sticking one’s nose in the Wall Street Journal or Twitter, poking around for news, hoping to get all the poop on what’s a-happenin’. And, akin to Twitter, Josie will leave his own little messages and barbs before looking up, getting on with his day. He stands still while I attach his leash to his harness. We mosey on down the lane. It was a little over three weeks ago that Elliott left his temporary home here in California to rejoin his family (that’s Josie and me) here in our temporary home here in California. The first week home, Elliott stayed in the house or on the deck. The deck has a railing with just one low crossbar, so early on my brother-in-law attached some lightweight garden fencing to the lower two-thirds of the railing so Josie would not, in some strange spasm, maybe to chase a bird or a lizard, leap off the deck. Now this fencing also held Elliott in. The door to the deck is usually open as here it is mostly warm and never rains. There are many birds to watch. Elliott seemed content with the situation. 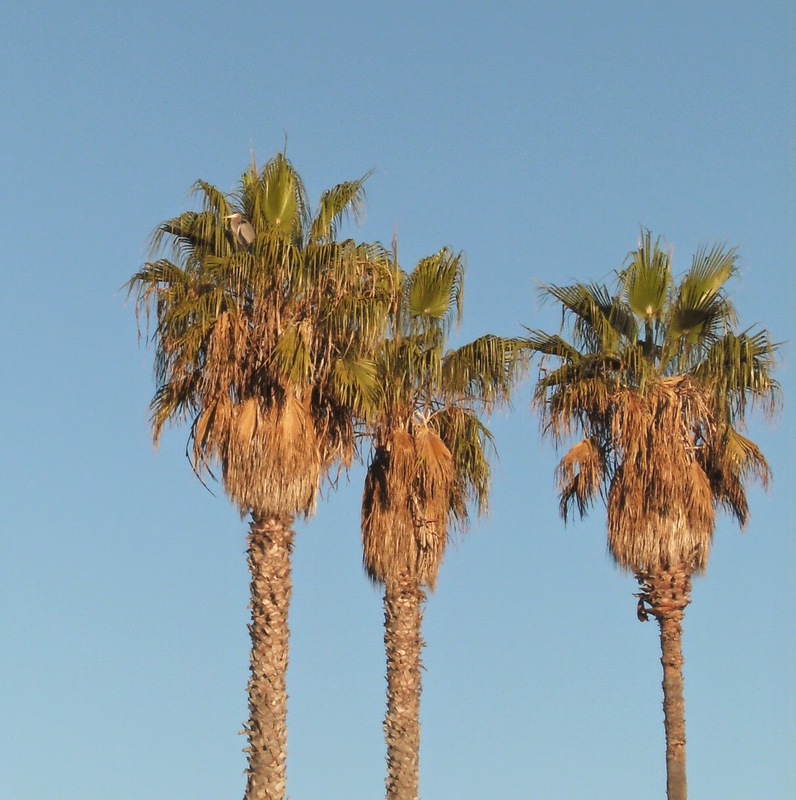 See that great blue heron up there in the palm tree? Two weeks ago, Elliott found a spot where he could easily push the garden fencing away from the deck, enough to slip down and out. At first I tried to stop this behavior, but what was I thinking? Elliott had found a way out, wanted out, and the idea of playing any more games with anyone seemed futile and ridiculous so Elliott had his way. Go forth and be free. I was pretty sure he would not go far. The deck looks out over a small yard, a decent-sized patch of lawn lined on one side with a brick wall and bushes, on another our home, and on another the neighbor’s driveway and small shed. 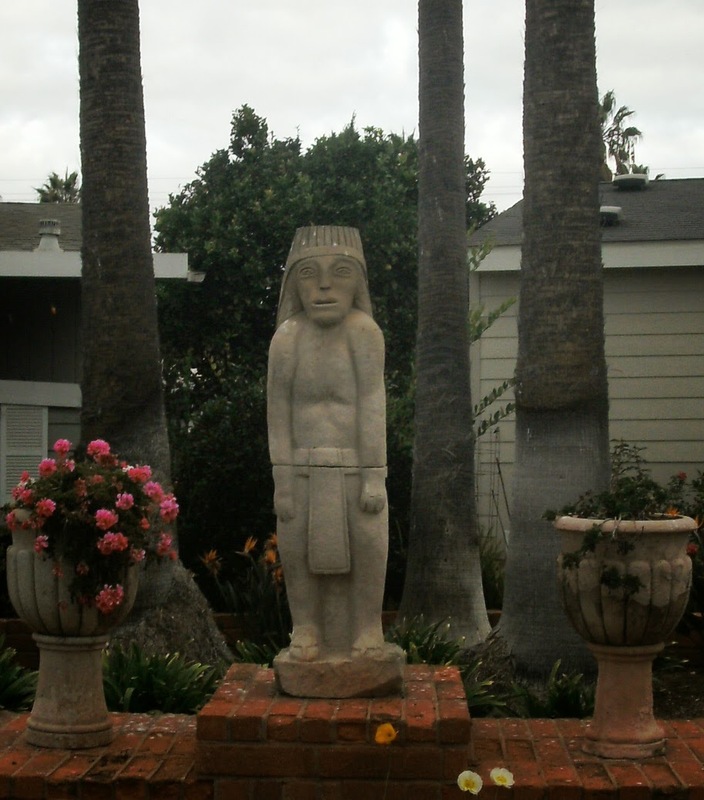 The yard is a trapezium and the very short side, anchored with a palm tree and small garden, lines up along the street, the cul-de-sac. Although it is quiet where we live, there is enough random activity and noise popping up here and there every now and again that Elliott is a bit cowed. He is not used to living where there are trucks and cars and people and dogs going by. He is not familiar with gardeners and leaf blowers. Deer and coyote and wolf and the like, now those he knows. I did not expect Elliott to follow Josie and me on our morning mosey. 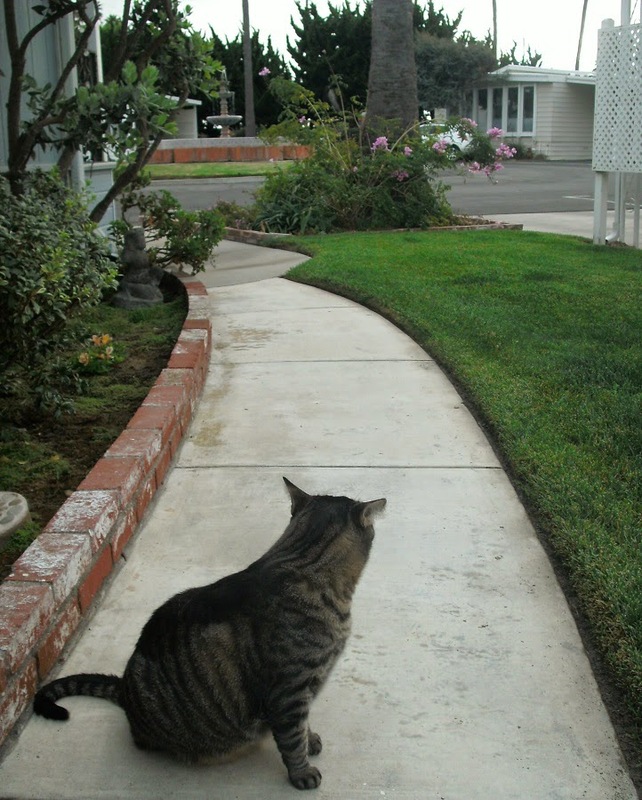 But on this morning, while Josie was busy with the Fountain Island News, I watched Elliott nosing around in the little garden in front our home. As Josie and I headed out, occasionally I looked back at Elliott to make sure he was staying put, and he was, but then he wasn’t. When Josie and I were about four or five homes down the lane, Elliott began walking slowly after us. I quickened our pace, thinking Elliott would fall too far behind and give up. I took a picture of some crows because that is what I had been thinking of writing about, all the birds here in this park, the crows and gulls and the blue heron in the palm tree and how one morning the crows were chasing a small hawk, but now here was Elliott still trailing after us. Something he really should not be doing. So Josie and I turned back. We ran into Elliott in front of a home with a nice front porch and there was this guy on the porch and when Elliott and Josie met he said oh, they’re buddies. Elliott scooted away, up the short walk of the home opposite, where the Person Who Does Not Like Dogs lives, and this was a drag because then Josie and I had to chase him without really chasing him, so as not to create any more of a ruckus, and since in this place where we now live one home’s front walk is right up against the next one’s driveway, Elliott is now in someone’s driveway and I’m not sure if he’s going to go farther down the driveway putting all three of us right outside the windows of two homes of people we don’t know and it’s like really early in the morning and of course there’s still this guy in his robe on the porch right across the street, and how I love Elliott, he just pivoted and ran back out into the street, the lane, and headed home and Josie and I followed and then close to home I let go of Josie’s leash so he could more properly chase Elliott and resolve this thing. Elliott ran into our driveway, tail high. Josie followed. Josie pooped then on the pebbles of my neighbor’s little side yard, and I chased Elliott to the back of the drive where he could circle around the back of the house and into the yard and, with any luck, get up on the deck and stay there. I picked up the poop and Josie and I started out once again on our morning mosey. 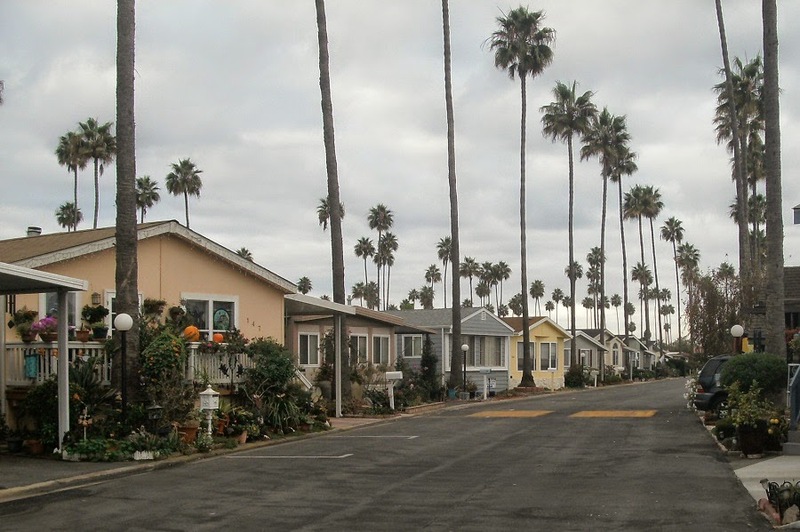 Where I live now is this: A 55+ mobile home park in southern California. 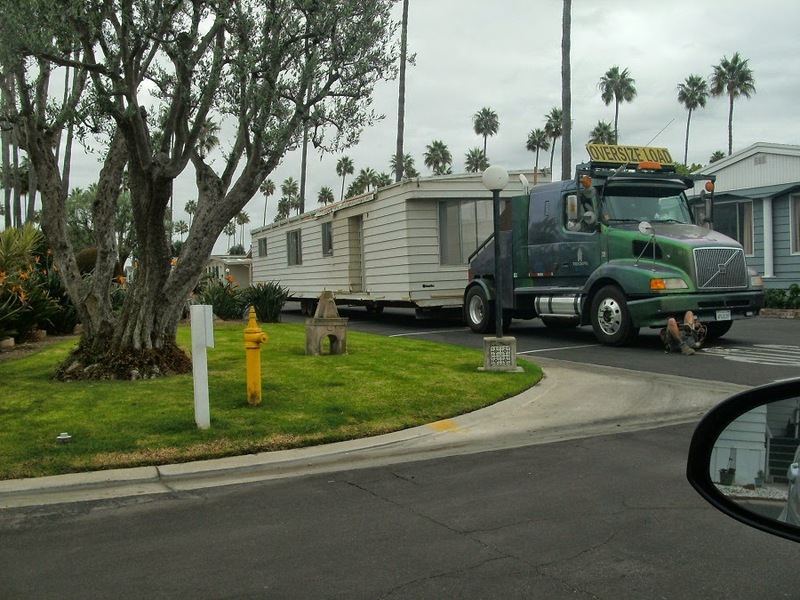 In the park, there are 309 mobile homes. Not that they are actually mobile. They are, indeed, stationary. But every once in a while one sells and gets yanked out and a new model comes in. So, in a way, mobile. There goes half of one right now. But quiet. After my mom’s nursing home (and I’ve given up trying to think of what else to call it), I think it is the quietest place within miles and miles. This guy doesn’t talk much. So yes. I live now in a 55+ mobile home park. I thought I couldn’t write about it, and there’s a lot of hocus-pocus and tomfoolery involved with that, but if I can’t write about where I live, well, that amount of change I cannot handle. I live in someone else’s house, pay for the privilege, and with most of the agreement being verbal it has been, let me tell you, somewhat messy. Maybe now things are settling down. I have thought that several times in the past month and a half. A rare morning mosey with clouds. It has been nearly 25 years since I lived anywhere but in my own home. And for the first time in many years—about ten, actually—I am living near my mother, spending time with her on a regular basis. In her past ten years she has lost much if not all of her independence. In the past month and a half I have lost, perhaps, just a little of mine. Not much. Not much at all. Hardly worth mentioning. And of course I could take my independence back, any time. Any time I choose. But sometimes I think choices are too hard. Decisions to make—too hard. I second-guess myself all the time, think I make bad choices, and I think it’s too hard, being on my own, doing all this, all this, on my own. But we all should be so lucky. Yes, we all should be so lucky. 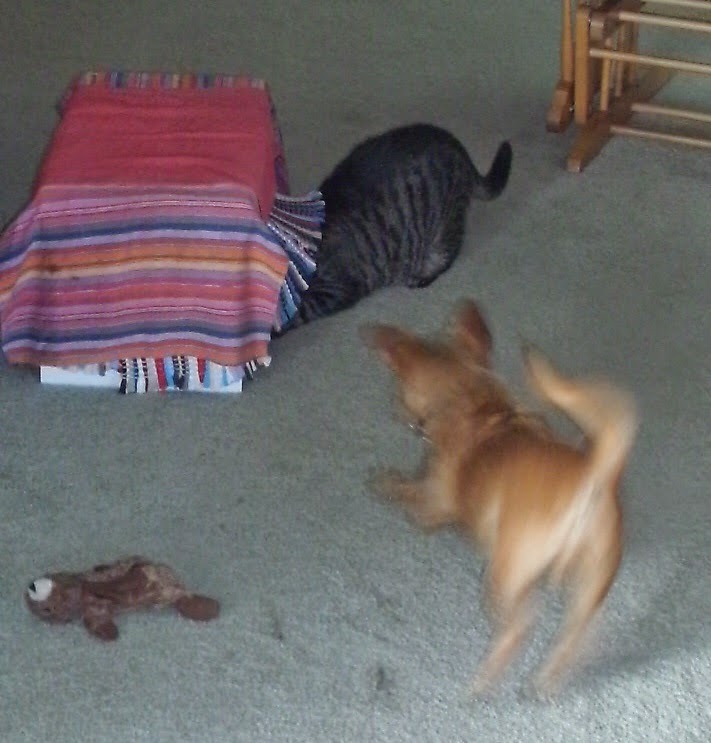 A game of dog-and-cat, part one. The other night it rained. 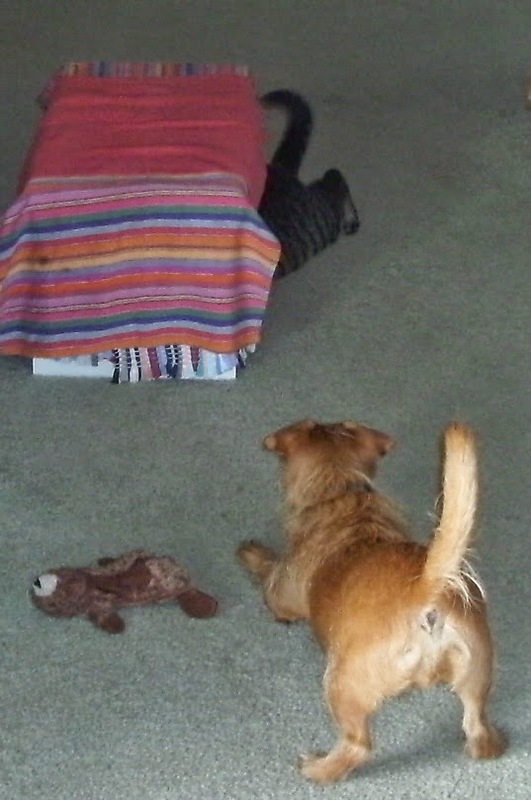 A game of dog-and-cat, part two. And it reminded me of home. Wow! My word. Those habitats are really close together. That would take a lot of getting use to considering the openess of your U.P. homestead. But, I am glad, for now, you are by your Mom and sisters. Yep. I believe there are more people here in this little acre (or whatever it is) than in all of Pelkie, Elo, Tapiola, Sand River, Deerton ... put together. And probably 10 times as many little dogs!